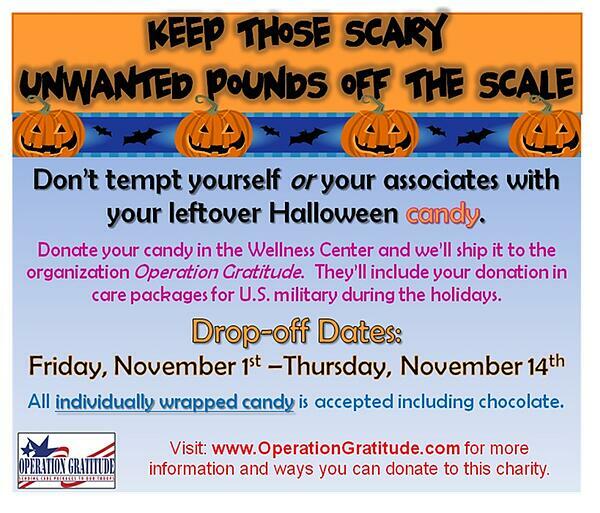 Curious how many steps you need to take to burn off that Halloween candy? 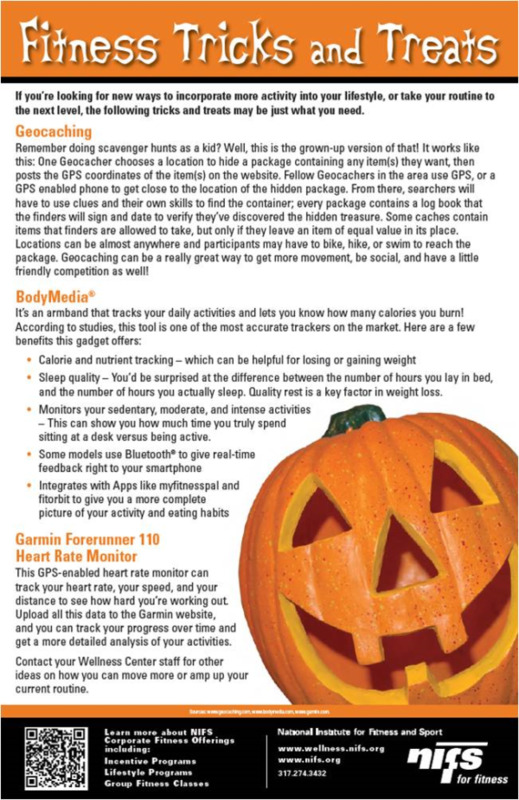 Check out this Halloween Treat Calorie Counter! Simply put, corporate wellness and philanthropy go hand in hand. This is one great example. What are you doing to cultivate giving back as a measure of good health? Before you carve those pumpkins for Halloween, put them to use for a good workout! NIFS Fitness Management staff in our corporate fitness centers had great success in offering pumpkin workouts to employees this month. If you think about it, pumpkins are like a medicine ball and come in a variety of shapes and sizes to accommodate all intensity levels! So grab that pumpkin off the porch and show your kids how to use a pumpkin for a workout! Squat and Curl – Hold a pumpkin in both hands with arms extended down in front of your body. Step feet wide with toes pointing out at an angle. Keeping your chest up, lower into a squat and hold the position. Now curl the pumpkin up toward your chest performing a bicep curl, lower the pumpkin slowly back down and perform 12-15 repetitions. Full Sit Up – Lay on your back with knees bent and feet flat on the floor. Holding the pumpkin on your chest, do a full sit up reach overhead with the pumpkin as you perform the movement. Slowly lower to the floor bring the pumpkin back down to your chest in one smooth movement. Repeat for 15 repetitions. 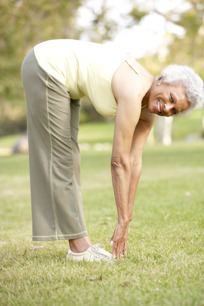 Toe Taps – Lay on the floor bringing your legs up toward the ceiling (bend your knees if a modification is needed). Holding the pumpkin in both hands, contract your abs and crunch upward pushing the pumpkin toward your toes. Rather than relaxing and lowering back to the floor, continue to quickly contract and release taping your toes with the pumpkin for 30 repetitions. Overhead press – With feet shoulder width apart, hold the pumpkin in both hands in front of your chest. Press the pumpkin up over your head extending your arms, and then slowly lower to the starting position. Repeat for 12-15 repetitions. Push Up Plank – For an advanced option, place both hands on the pumpkin, if that is too much you can place one hand on the ground and the other on the pumpkin. Extend your legs out behind you into a plank position. Slowly bend your arms to lower your body toward the ground, push through your hands and shoulders to return to the starting position to complete a pushup. Strive for 10 repetitions. Russian twist – Sit on the ground with the pumpkin in your lap. Place your feet on the ground shoulder width apart, for a more advance move lift your feet up keeping your knees bent. Holding your pumpkin lean back slightly, dropping your right shoulder and taking the pumpkin toward your right. Slowly move back toward the middle and continue toward the left. Continue side to side for 30 seconds. Now get creative and share with us what your favorite pumpkin exercise is!! One of the most versatile and healthy foods out there also happens to be a favorite for most when decorating this time of year. Pumpkins are not only something that can be used to spruce up your front porch in the fall but is also an excellent addition that should be incorporated into your daily eating routine! Pumpkin is loaded with Vitamin A, which helps with vision. The carotenoid, beta carotene, in pumpkins is converted to Vitamin A for even more eye protection! This antioxidant has also been found to have a role in cancer prevention. It is also loaded with fiber (3 grams for 1 cup), which we know is excellent for heart health. One final perk of pumpkin is the amount of potassium it contains. Electrolytes, especially potassium, are important after a hard workout, and 1 cup of pumpkin provides more potassium than a banana (564 milligrams vs. 422 milligrams). 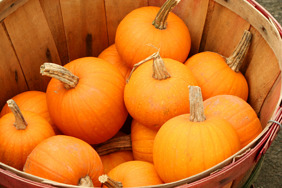 Try these recipes to obtain all of the health benefits that pumpkin has to offer! Mix pumpkin, pudding mix, cool whip, and pumpkin pie spice together by hand in a very large bowl and chill for several hours before serving. Sprinkle with cinnamon, and serve with fresh apples slices, vanilla wafers or ginger snaps. Put all ingredients in the blender and blend until smooth. Pour into a glass and enjoy! In a large soup pot, brown ground beef with pepper, onion, and a drizzle of olive oil. As the meat and veggies are cooking, sprinkle over chili powder, cumin, garlic powder, onion, powder, and a healthy pinch of salt and pepper. When the meat is cooked through, and the veggies are tender, add pumpkin puree, undrained beans, and the tomatoes with their juice to the pan. Cover and simmer until ready to eat. Pumpkin isn’t just for pie! These recipes can be included anytime during the day. For more information on pumpkin or other super foods, please contact Angie Scheetz, RD at ascheetz@nifs.org or 317-274-3432 ext 239. Are you looking for a new, quick, high-intensity workout routine? Then Tabata may be the training style for you! Be prepared to go all-out for short durations of time to increase your strength, while improving your cardio at the same time! Tabata facilitates a workout which is so intense that 8 rounds will be completed in only 4 minutes! If 4 minutes are enough, then you have completed a full Tabata set, if not, choose a different exercise and repeat the Tabata! Do as many repetitions as possible in the 20 seconds of work. Pick weights which are hard enough to make you breathless after 20 seconds, but light enough to be able to complete all 8 rounds. Pick an exercise which works most of your body. Have fun, work hard, be creative, and make the workout yours! What is your favorite Tabata style workout? 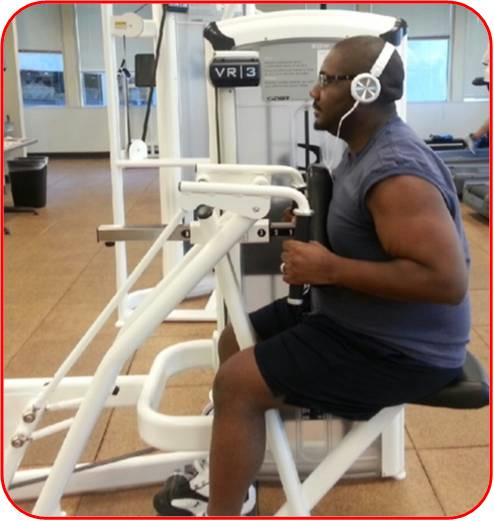 Lasalle Pinnock joined the corporate wellness center in July when his department moved. 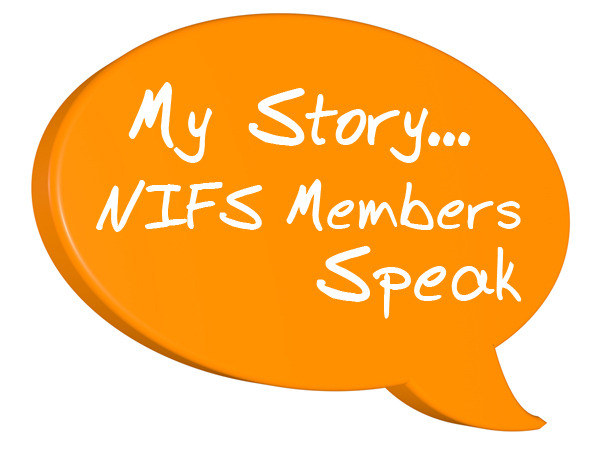 Almost immediately he scheduled an exercise prescription with the NIFS Fitness Management staff and has been following that exercise program ever since. He started with a few days of strength training and cardiovascular exercise. After about a month he came to the staff looking to add one more day of activity to his routine. Each week he updates us on his progress not only with weight lost but how he is improving in stamina and strength. Because of his dedication to exercise he has also been motivated to make healthier choices when it comes to his diet and started sharing the things he’s learned with his wife. I started working in the Wellness Center when my department moved from the Galleria location because I felt I had no excuse. The gym is right here at work, what more can I ask for? This was the best time and opportunity for me to really focus and make changes in my life. My beautiful wife and kids are who keep me motivated to work out and eat healthily. Having two young daughters, I told myself I want to be alive to see both of them go to college and get married. I knew I had to make changes and they are what keep me going. Since starting in the gym and using Penny’s workout routines I have lost a little over 10 pounds in just under month. I have also changed my eating and drinking habits greatly. I was a huge Coca-Cola® drinker and used to drink Cokes daily. I now only drink water throughout the day. I will have the occasional Coke® or Coke Zero® on the weekend. I have cut out fast food, fried, and greasy foods. If I’m unable to eat a healthy meal I make sure I eat a smaller portion. Instead of getting sodas or chips from the vending machine I grab trail mix or eat some type of fruit. I have noticed since working out I have so much more stamina, energy, and I am less tired during the day. I can really feel and see the difference in my mood and body. Mentally I feel more focused and less stressed, I just feel great. Right now my goal is to stay focused and to keep moving forward. I want to reach my target weight and inspire others. My advice for others is this, It’s hard and it’s going to take some time but don’t let that stop you because it’s worth it. One of the best quotes I’ve read and that keeps me going is, “Some quit due to slow progress. Never grasping the fact that…slow progress is progress”. A plyometric exercise is one that includes a stretch of the muscle, followed by an explosive movement, working the power aspect of the muscle. For example, in a jump squat, you will bend the knees and lower down towards the ground, stretching the quads and glutes, then jump straight up into the air in an explosive movement, landing back into the deep squat. Plyometrics are found in many intense workout formats like boot camps and popular DVD series like Insanity. When plyometrics are performed over the course of 30-60 seconds, not only are the muscles being challenged, but it will become a fairly intense cardio workout as well! Need more ideas for changing up your routine? Subscribe to our blog, or visit our YouTube channel for exercise demos created by our NIFS Fitness Management staff. When I first began working at a CCRC a year ago I learned that Zumba® classes were being taught. I was very intrigued and actually sat in on the class within the first couple days of being here. Prior to attending the class, I kept thinking to myself that this was a pretty intense class to be taught to seniors. After attending the class I was pleasantly surprised as to how enjoyable the class is for the participants. The type of class that was being taught is actually called Zumba Gold® and was specifically designed for active seniors as well as those participants who may not be ready for full on Zumba®. Zumba Gold® still uses the same concept of original Zumba® by incorporating exciting Latin and international dance rhythms. Some of these dances include Merengue, Salsa, Cha Cha, Cumbia, and Belly Dancing. You are guaranteed to get a full body workout but the exercises are modified for success and safety. A lot of the moves may even be done at 1/2 tempo so that everyone is able to follow. The most interesting thing that I observed was that many of the participants were seated during the Zumba Gold® class. This makes the class available to everyone, including those who may be in wheelchairs or are unable to stand for long periods of time. The residents at our community absolutely love that this class is offered! It is one of our most well attended classes at our community. This population has grown up around music so what better way to get some exercise while dancing around to good music! I hear over and over again from the residents that it doesn’t even feel like they are exercising because they enjoy the music so well and they just start grooving. If you are interested in having Zumba Gold® at your CCRC you will first need to have a licensed Zumba Gold® instructor to teach the classes. There are always training workshops being taught all over the United States you just have to find the one nearest to you. You may find these training workshops at the following address Zumba Training. Now the question is are you ready to live up to the Zumba® motto and ditch the workout and join the party?